Many of the people are planning to begin their blogging carrier in 2013. Majority of these choose blogger for getting a startup in this field. Blogger just provides a template for your blog, but the contents of your blog should be customized by the author/designer of the blog. Every blogger blog should require some basic things . Even though whatever be the content of your blog , in order to build good traffic and Rank these are the necessary things. Domain names really shows the identity of you blog. It is the most necessary thing for your blog in order to build good traffic/readers for your blog. You have to pay small amount for purchasing a domain name. We suggest the best domain registration company BIGROCK for getting domain names at cheapest prices, your use the discount coupen to get 50% , 25% discount in the rates of domain names. 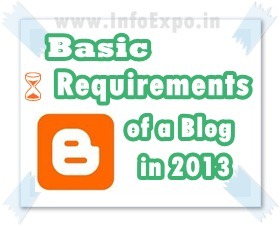 Site Map is another basic requirement of a blog. Site Map contains all the post and page links of your blog, at a glance , which helps your visitors to find best contents. It brings great traffic for your blog. You can read Create a sitemap of your blogger blog post to know how to create a sitemap of your blog. Contact page for your blog. Your blog too requires a good contact page in order to develop good relationship with your readers. Read Create a contact page for your blogger blog to know how to create a contact page for your blog.